Planting bushes along the front, sides and even back of your house helps to visually tie the house to the land that surrounds it. The foundation plantings, have a way of softening the transition from the rolling lawn, to the house that is jutting out of it. This post is about a few things that you should think about when siting foundation plants by your house. Too often, when I walk in my neighborhood, or drive around, I see that many people have planted foundation plants too close to their houses. Before planting your foundation plants, take these 3 things into consideration. Number 1 ..Will you be washing the windows that are behind the foundation plantings? 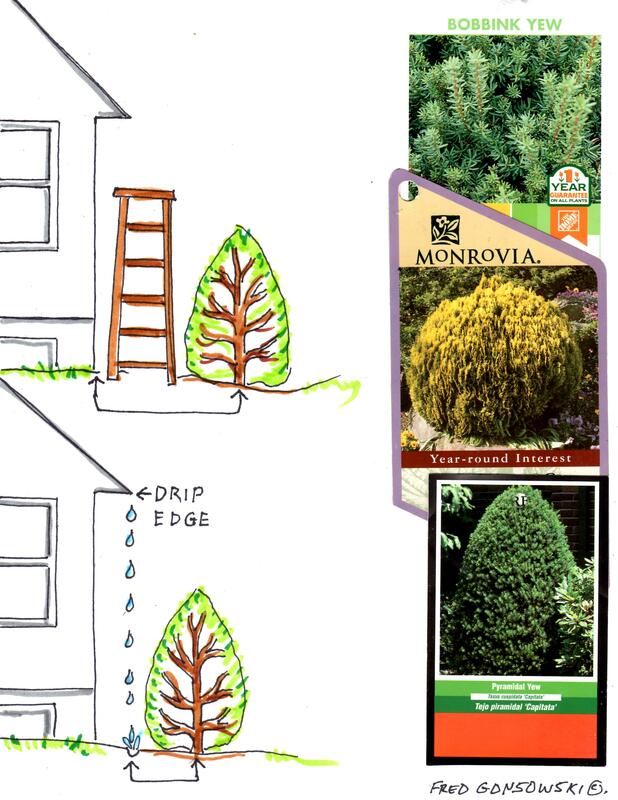 If so, leave 3 feet of space (the width of a standard 6 foot ladder is 22 inches, and some extra space for good measure), from the front, side, or back wall of your house, to where you think the back edge of your mature-established bushes will be. This will give you room to walk behind them, set up the ladder, and wash the windows (this also applies to painting the house). Secondly ..Think about your roof, its overhang, and the drip edge of your roof. Every time it rains, water will be falling off of the edge of your house’s roof, right onto the bushes which will damage them and erode the soil. You might say I have gutters. If you live in a cold climate, even with gutters, icicles can form, will drip, and can fall onto the foundation plants growing below them. Even with gutters, you must have a way of getting close to them for occasional cleaning. You should always plant foundation plants so that when mature, their back sides are past the drip edge of your house. Third ..When contemplating how far from your house to plant foundation plants, also consider the width and height the bush will be at maturity. An upright, pyramidal or spreading yew, etc, that looks small now, in 5 to 10 years will be much bigger. Look at the plant tag to see how wide and tall the plant grower thinks it will grow. Those numbers are averages, if the plant likes where you site it, it could grow even bigger. Take the suggested width dimensions, divide them in half, and add that to the amount of space you have already allotted for the window washing ladder, or drip edge. You might say I have windows that can be cleaned from inside, so I can plant foundation plants right up against the house. Foundation plants, especially evergreens, need light and air movement to stay green and healthy on all sides. If you plant them too close to your house, they will not have proper photosynthesis (light collection) on the side facing the house. The light deprived side will start to die off. Leaving space for air circulation and sunlight around your house is also important. It keeps moisture / dampness down, which does not encourage moss or mold to grow on your clapboard, shingles, or bricks. Now look at the illustration. In the upper drawing, notice the amount of space I have allotted for the ladder and window washing, and foundation plants. In the lower drawing, notice the overhang of the roof, with drip edge, and the amount of space needed for foundation plants. The choice in the end is yours. When allowing for space, a little more is better than less, in the long run. I hope these 3 bits of information have inspired you. Happy Foundation Planting! Planting a tree by Your House 4-26-2012. This entry was posted in Bushes, Shrubs, Trees, Garden Design Principles, The Autumn(Fall) Garden, The Spring Garden. Bookmark the permalink.